RadDataGrid provides built-in filtering functionality, that allows the user to easily filter data by one or more columns - Filtering UI. Everything that can be achieved by the end user through the UI can also be done by using the code-behind API. RadDataGrid also allows programmatic approach for filtering. This can be achieved through RadDataGrid. FilterDescriptors property by adding FilterDescriptors. 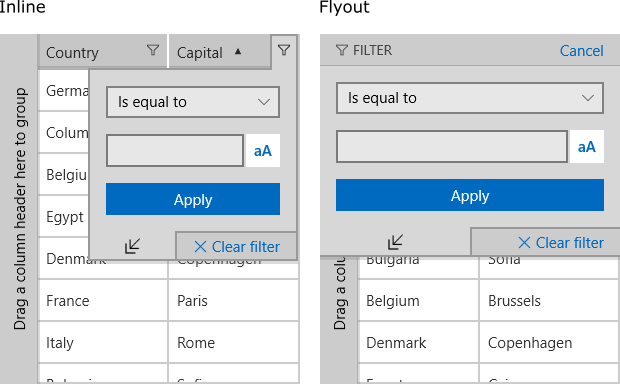 The built-in Filtering UI allows the user to easily filter data by column values. The filtering functionality will be enabled out-of-the-box for most .NET primitive types such as strings, numeric types, DateTimes and so on. You can use the UserFilterMode property of RadGridView to enable/disable the filtering UI. To enable/disable the filtering of a specific column you can use the CanUserFilter property of the column. There are two filter modes that depend on the value of the RadDataGrid.ColumnDataOperationsDisplayMode property. Inline Filter UI: The ColumnDataOperationsDisplayMode is set to Inline. The Filter UI is integrated in the column header. Flyout Filter UI: The ColumnDataOperationsDisplayMode is set to Flyout. The Filter UI is displayed with slide animation from the top of the grid. See how to curtomize the control in this topic. SecondFilterControl: it can be enabled/disabled using the ExpandCollapseButton. LogicalOperator: when the SecondFilterControl is enabled this operator defines the logic applied between the filter controls. FilterButton: applies the filtering options to the grid. ClearFilterButton: removes all filtering options of the FilteringFlyout control.